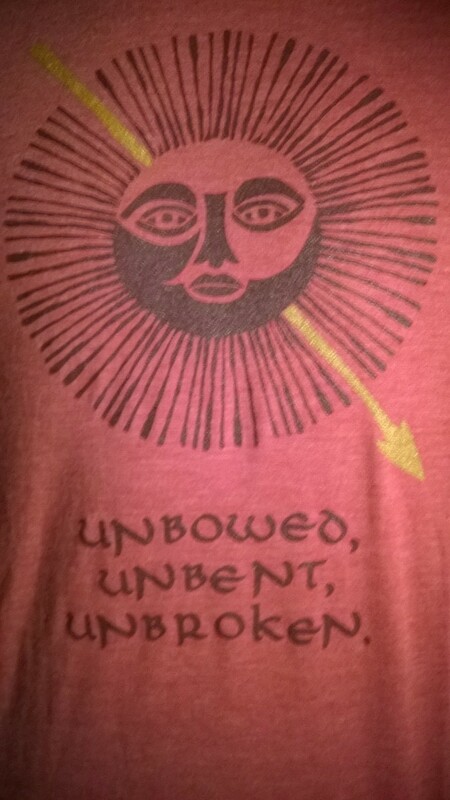 The words accompany the house’s sigil: The Sunspear. A symbol that radiates a determined strength and fullness. The sun shines out, and not only will he not be bowed, bent, or broken, he will overcome all obstacles with the sharp point of that radiant spear. I do not offer this imagery and these words as some sort of call to violence or rage. Rather, if you are going through hard times, and I see so many going through their own heartbreaking transitions right now, you can resolve yourself to be unbowed, unbent, and unbroken. You are a warrior in the sense that you can discover your own strength, dignity, and basic goodness, no matter how difficult life may be. Remember: you cannot control the events of the world, the myriad unfoldings of the universe, or the trials and tribulations of your fate. However, you can control how you react to them. So, stand tall. Shine. Resolve yourself to face them, not run away from them. Smile upon them with that glowing strength, and you may just find that you can bear so much more than you ever thought possible.